A sparkling, dark-haired girl suddenly popped out on the upstairs landing and hung over the staircase. Her cheeks were as red as her sweater and her black eyes shone with excitement. She took one look at her mother, gingerly holding up an envelope; another at her young friend Midge, hopping up and down with a strange lack of dignity for a fifteen-year-old. Cherry swooped down the stairs and seized the official-looking envelope. “What does it say?” Midge begged. Mrs. Ames, too, was trying to glimpse the letter over Cherry’s shoulder. “Here,” Cherry said, absorbed, and allowed Midge to hold the empty envelope. “What does it say?” Mrs. Ames echoed Midge. She was a small, youthful, brown-eyed woman. There was another notice, too. “You are ordered to report to the Service Command at Wabash City…for Army physical examination!” … “Oh, gosh!” exclaimed Cherry. “You have to weigh at least a hundred pounds and a lot of other things,” Midge warned her. 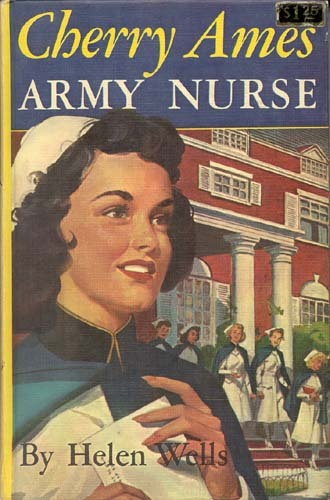 “She’ll pass,” Mrs. Ames said, smiling at Cherry, “even the Army’s rigid examination.” Cherry’s red cheeks and lips, her shining dark eyes, her eager, lively, pretty face, even her dancing black curls, fairly radiated vitality. She sparkled with youth and high spirits.